This view of the Earth's crest over the lunar horizon was taken during the Apollo 15 lunar landing mission. 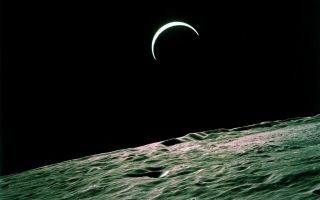 This space wallpaper of the Earth's crest over the lunar horizon was taken during the Apollo 15 lunar landing mission. Apollo 15 launched from the Kennedy Space Center (KSC) on July 26, 1971 via a Saturn V launch vehicle. Aboard was a crew of three astronauts including David R. Scott, Mission Commander; James B. Irwin, Lunar Module Pilot; and Alfred M. Worden, Command Module Pilot. The first mission designed to explore the Moon over longer periods, greater ranges and with more instruments for the collection of scientific data than on previous missions, the mission included the introduction of a $40,000,000 lunar roving vehicle (LRV) that reached a top speed of 16 kph (10 mph) across the Moon's surface.